286 pages | 45 B/W Illus. As online courses and digital learning enable more people from more places to learn together, it is crucial for instructional design to incorporate diverse cultural perspectives. Culturally Inclusive Instructional Design provides a framework for thinking about culture in digital learning, offering insight into how to build inclusive online communities that encourage reflection and growth, regardless of content domain. Chapters cover the foundation, components, and implementation of the authors’ Wisdom Communities (WisCom) framework, which enables learners from global backgrounds to experience long-lasting, transformative learning through real-world problem-solving. This book is a timely, resourceful guide to building truly collaborative, inquiry-based online learning experiences. "This exciting addition to digital learning literature integrates cultural sensitivity into the instructional design process. The book builds on previous work by including case studies, mentoring guidelines, and the authors’ WisCom framework, an excellent tool for creating global, collaborative, inquiry-based online learning. Culturally Inclusive Instructional Design is essential reading because of its timeliness, global perspective, and clarity. Highly recommended!" "The two greatest challenges facing us are clashes resulting from different cultural perspectives and the need to acquire wisdom to deal effectively with the environmental challenges created by 8 billion humans living together on this planet. This books speaks directly to both of these challenges. Only if learning matches, reflects, and enhances our cultural experience will it empower us to meet global challenges. The book is a must-read for anyone designing learning for both global or local contexts." "This book offers a design framework to address and challenge persistent gaps faced by marginalized students while holding high expectations for all educators. WisCom is a student-generated framework that not only applies to everyday instructional design tasks but also helps transform learners to change themselves and the world. A must-read for instructional designers!" "This book provides a much-needed framework for placing the elusive but central concept of culture in the core of the process of designing online learning communities. Dr. Gunawardena and her colleagues present a living model of cultural communication that emanates from sharing perceptions and experiences among learners from diverse cultural backgrounds. Embedded in this formative process is a well-structured learning design strategy and a specific method of development and evaluation for building wisdom communities. The book embodies the clarification and resolution of global cultural experiences that are often perplexing and even contradictory by employing specific collaborative learning and mentoring methods that lead learners to wisdom—the apex of their educational experience." "In Culturally Inclusive Instructional Design, the authors have shared their longitudinal design processes and functional design conjectures of an online course that highlights and integrates cultural diversity in collaborative inquiry-based learning. The book presents a solid discussion of the theoretical foundations of online learning communities and culture, and a detailed description of each core component of the culturally inclusive online course design model. Specific design protocols and exemplary materials have supported the design conjecture discussion. 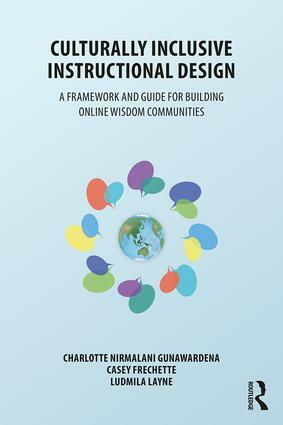 The book will help to enrich the design knowledge base of online learning community development and culturally inclusive instructional design." Charlotte Nirmalani Gunawardena is Distinguished Professor of Distance Education and Instructional Technology in the Organization, Information, and Learning Sciences Program at the University of New Mexico, USA. Casey Frechette is Assistant Professor of Journalism and Digital Communication at the University of South Florida St. Petersburg, USA. Ludmila Layne was Associate Professor at Simon Rodriguez Experimental University, Venezuela, and currently serves as the Managing Director of Armone Solutions, LLC.